Sunsilk Keratinology Sun Kissed Color Therapy Shampoo, Rs.170 ~ It's a light golden color creamy shampoo that lathers thickly- like no other shampoo I've used. It makes my hair softer, clean, and I experience less hair fall with it. I am loving it a lot, and it has become one of my favorite shampoos. Sunsilk Keratinology Heat Protectant Spray, Rs.400 ~ If you blow dry & iron your hair everytime after shampooing, YOU-NEED-THIS. It makes blow dried hair more bouncy & shiny, adds a little volume & the straightening iron glides on more smoothly. Before, I used to hear a trat-trat hair-against-ceramic plates sound when ironing, but not when I spray some of this before the process. I really saw the difference with & without this spray. Nope, it doesn't make hair greasy, coz it's watery. For me, it was love at first use. Must-have. 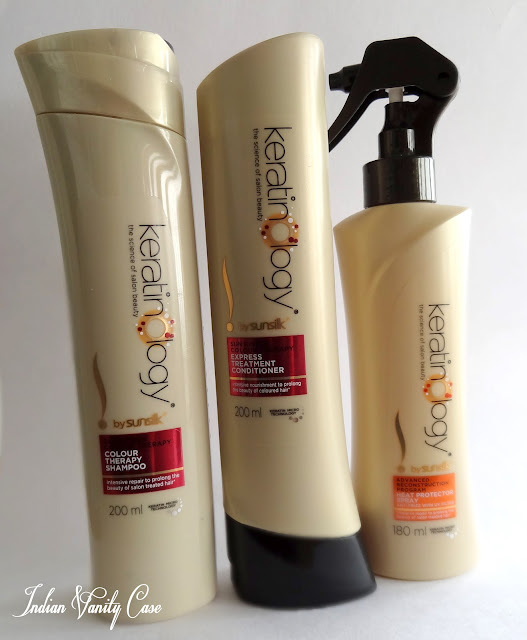 Overall, Sunsilk Keratinology is an awesome range & worth a try, plus all the products smell great! Like perfumed bananas, off the top of my head. Next, I'm going to try the other version of Sunsilk Keratinology- Advanced Reconstruction Program ones. *Shampoo & Conditioner bottles, though pretty, are not travel-friendly. They leaked when I packed them for Mumbai. thnks for sharing .. ll check out heat protectant spray !! I need that heat protectant spray...thanks for letting us know. I find that a lot of heat sprays make the hair stiff...does this one do that? I'm so jelly that you guys have these in India! I want to try them too! Heat protectant spray is not available in chennai, what to do?